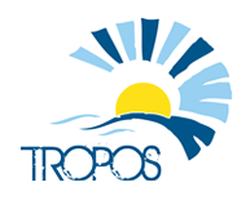 TROPOS is a European collaborative project funded by the European Commission under the 7th Framework Programme (FP7). There are 20 partners from 9 countries working on this project which is coordinated by PLOCAN (Spain). The project aims to develop a floating multi-use platform system in deep tropical waters which would guarantee synergistic exploitation of oceanic resources in a sustainable and eco-friendly manner. The platform will integrate a wide range of sectors such as ocean renewable energy and food (aquaculture) resources and it will also be used as a hub for maritime transport, leisure and oceanic observation activities. The overall strategy for the platform will be constructed combining the Technical Strategy and the Viability Strategy. The technical strategy will bring together the results from Work Packages which consider technical aspects of the platform. The Viability Strategy will covers soft issues such as finance, environmental and infrastructure aspects. The Policy and Innovation Group lead the WP5 (Work Package 5) which is concerned with the economics, infrastructure and logistics; it also contributes to environmental work.